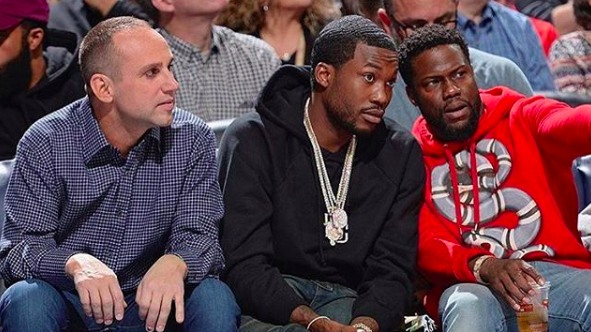 Meek Mill went from sitting behind bars to sitting courtside in a matter of hours, an undeniable boss move that adds to the widespread excitement he is finally a free man again. After experiencing over five months of frustrating legal roadblocks since his controversial November sentencing, the Pennsylvania Supreme Court ordered the immediate release of the beloved Philadelphia rapper earlier Tuesday evening (April 24). Philadelphia 76ers co-owner Michael Rubin promptly stepped in upon getting word of the good news, even going as far as to provide a helicopter to ensure Meek would be where he belonged on the first day of his release: supporting his home team as they take on the Miami Heat during Game 5 of the 2018 NBA Finals. With Meek being able to ring the ceremonial bell before the game and cheer on the team, who has shown him consistent support since he was reincarcerated, the 76ers were blessed with an extra boost of good luck and positive energy, going on to heroicly and fittingly defeat the Miami Heat and snag a Game 5 victory. As a result, the team will be moving onto the second round, winning their first playoff series in six years. Naturally, once the scoreboard officially reflected the final score of 104-91, the internet and the city of Philadelphia alike absolutely went bonkers. Take a look at how fans are happily welcoming Meek Mill home and celebrating the massive victory, below. Eagles won the super bowl, Meek Mill free and the 76ers advancing to the semifinals... Philly gotta be lit rn. Meek getting picked up from jail by the 76ers owner, brought to the arena to get a shape up and fresh outfit, then straight to a courtside seat to watch a playoff game is legendary. Meek Mill is released from jail and shows up courtside after being helicoptered in the same day the 76ers win a playoff series in a year the Eagles won the Superbowl. Nipsey Hussle shares his video for "Victory Lap"